Aarti over at BookLust is hosting A More Diverse Universe, a blog tour designed for bloggers to spotlight Speculative Fiction (Scifi/Fantasy/Magical Realism) written by authors of color. 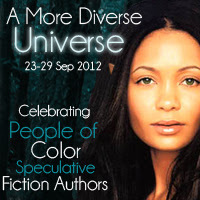 You can read the entire post for more information and sign up for A More Diverse Universe here. It's a great post. Aarti provides some great links to explore authors of color who write Speculative Fiction. Basically, she wants bloggers partial to the genre, to read one book by an author of color and share their experience/thoughts in the form of a review during the blog tour near the end of September. 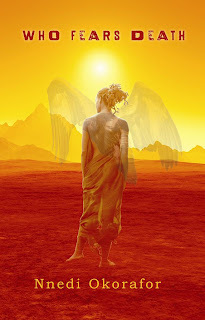 Who Fears Death won the 2011 World Fantasy Award for Best Novel...It's probably a great place to start. I've never heard of the Nnedi Okorafor so I'm curious to see what she's about. In my search for a book, I also came across the works of Octavia Butler....I haven't read any of her stuff either, but I'm already inexplicably obsessed with her. This is the only blog tour has caught my attention and held it...so I'm excited for it. ps--Thandie Newton (on the graphic for the blog tour) makes a great elf/fairy, or whatever it is she's supposed to be...a gorgeous woman.